Boronia will steal your heart, then break it! I confess there is an element of nostalgia in my love of the tiny brown cups of fragrant Boronia megastigma. I grew up in Tasmania, where these West Australian natives are widely grown. In the fifties and sixties my grandmother would venture forth to the Methodist Ladies Guild looking ever so stately in her feather trimmed hat, soft kid gloves, and a generous bunch of boronia pinned to her bosom. The fragrance Marian Cran mentioned is an intoxicating blend of spice and citrus. Some say it resembles a blend of freesia and osmanthus, but to me the perfume is unique and incomparable. 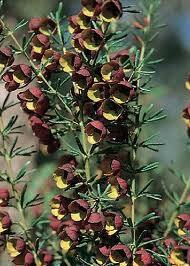 Oddly enough there are some people who are incapable of smelling boronia perfume…thank goodness I am not one of them! Another odd characteristic is that if you smell the flowers at close range you may not catch the fragrance. But walk on by and and it will be carried to you on the air. Boronias will steal your heart, but just as easily break it. Their life-span is short; shorter still if they do not have exactly the right conditions. I was touched to discover that they were named to honour an 18th century Italian botanist, whose life was correspondingly brief. Francesco Borone died after falling from a window in Athens at the tender age of twenty five. Sir James Edward Smith. 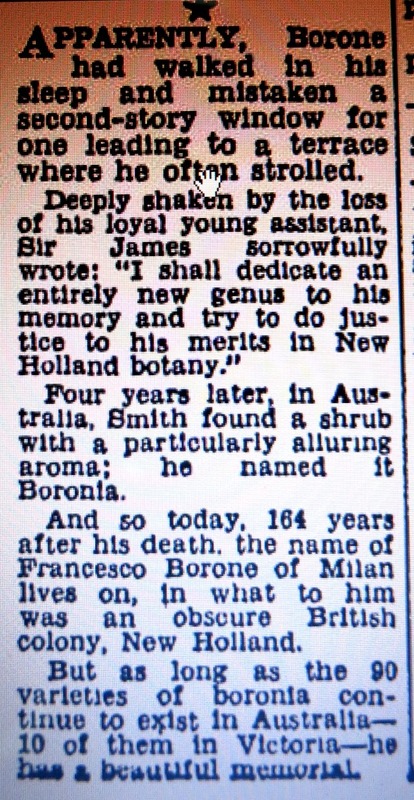 who named Boronia in memory of his young assistant. The young man been born in humble circumstances. 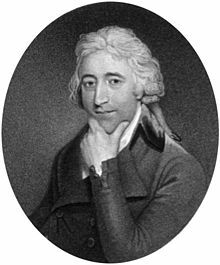 Originally a domestic servant to the famous British botanist Sir James Smith, he rose to become Sir James’ valued assistant. 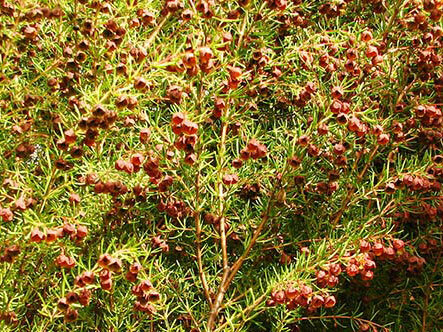 No wonder May Gibbs was inspired to write Boronia Babies. Boronias require sandy but humus- rich soil, good drainage, dappled shade, and a thick summer mulch. It is very difficult to propagate them from seed, but cuttings can be taken, preferably from November to March. Many years ago I discovered a magical thicket of boronia megastigma in Canberra’s National Botanic Gardens. I wonder if it’s still there? Fortunately for Boronia lovers, Phillip Vaughan of Mt Cassell Nursery in Victoria has make life a little easier by grafting brown boronia onto a hardier stock called Boronia clavata , which is more resistant to root rot. In my opinion Boronia megastigma is one of the few plants from which it is possible to distil and capture the true fragrance of its flowers in a commercial perfume. Unfortunately it is almost as difficult to find the perfume (as opposed to the oil) as it is grow the plant. Nevertheless, it is worth searching for, as it is remarkably inexpensive. Eash golden chalice with perfume was filled, and brought me a message I know. And ever the carol of birds on the wing. in summer that passes too soon. As caskets of jewels from the lands of the east, so rich are the memories it spills. Not piquant the scent, now the flower has been crushed, but mellowed as kindly time will. Nor speaks now of gardens with summer aglow, but of evening, so placid and still. WHAT IS YOUR FAVOURITE PERFUMED FLOWER? LET ME KNOW IN THE COMMENT BOX. DON’T FORGET TO COMPLETE THE ANTI-SPAM SUM BEFORE YOU PRESS ‘SUBMIT’. Gardenia. There’s a hint of corruption in its sweetness, and it reminds me of film noir nightclubs. Yes, I know what you mean Mike. Warm and exotic. Like the climates they grow in. I’ve never had any luck growing Boronia so don’t really have any favourites. I can’t grow it either. I buy the perfume instead. Where can you get the perfume from? Looking for some for my wife (it’s her favourite), but proving difficult to find, especially without a brand name on the bottle. Sorry Judd, but it is now very difficult to find, even on-line. My friend tells me she sometimes sees it for sale in Wagga. Maybe it will be more widely available for Christmas. Oh, I do envy you, Terry. I think I might have to move to W.A. so I can grow it. 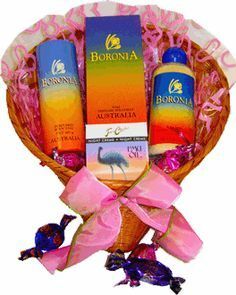 where can I purchase the boronia perfume from I the gift basket picture on this site? sadly the perfume is no longer made, if you are lucky and live in Australia you may find a chemist with some old stock but as the company who makes it no longer exist it is impossible to find anymore. my mother loved it, and I’ve been looking for something similar and reasonable priced for at least 2 years now. Thanks so much for letting me know, Colin. No wonder I haven’t been able to track it down. I will update the article. Very sad indeed.